The Christmas season is almost upon us once again. Present buying, gift wrapping, menu planning, decorating – with so much to do and to organise it’s no wonder we start our Christmas planning early. To make your home and table look beautiful, festive and unique this year, why not make your own Christmas Flower arrangements as part of your seasonal decorations? Whether as a centrepiece for the table or simply to brighten up a room in the house, floral arrangements add colour and vivaciousness wherever they are. Interflora Poinsettia plants have been a traditional Christmas flower for centuries are commonly featured on a lot of tables during the Christmas season. Legend has it that in 16th century Mexico a young girl couldn’t afford gifts to celebrate the birthday of Jesus Christ. Instead, she gathered weeds from the roadside, yet in the midst of these weeds sprang beautiful red flowers, borne of the girl’s love for Jesus, which became poinsettia. 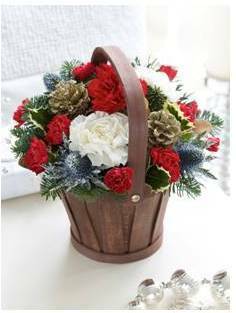 Simple arrangements work best for these vibrant plants – either three or five stems in a wicker basket surrounded by ivy or moss is all you need to make an ideal Christmas decoration. To give your living room a festive aroma, try using cinnamon sticks in a flower arrangement. Combine them with eucalyptus, holly (including berries), mini pears and pine stems to create a Christmas bouquet that not only looks spectacular but smells deliciously spicy too. For an additional touch, arrange them in a see-through glass vase and line it with more cinnamon sticks, berries and leaves. A wreath is a traditional Christmas door decoration and a home-made version will wow your friends and neighbours. You can combine supple willow branches with wire and jute to create a base, then thread through any combination of flowers, berries, pods and leaves that you wish. Alternatively, you can purchase a florist’s ring and start from there, but remember to decorate the sides as well as the front.